Rashid Khalidi: Leaked “Palestine Papers” Underscore Weakness of Palestinian Authority, Rejectionism of Israel and U.S. | Democracy Now! Rashid Khalidi: Leaked “Palestine Papers” Underscore Weakness of Palestinian Authority, Rejectionism of Israel and U.S.
Edward Said Professor of Arab Studies at Columbia University’s Department of History and the author of several books, including Sowing Crisis: The Cold War and American in the Middle East and Iron Cage: The Story of the Palestinian Struggle for Statehood. AMY GOODMAN: Newly released documents show Palestinian negotiators secretly agreed to give up large tracts of West Bank land in peace talks with the Israeli government. The disclosure is among many contained in what’s being called the “Palestine Papers” — thousands of pages of confidential Palestinian records covering more than a decade of negotiations with Israel. It’s being described as the biggest leak of confidential documents in the history of the Middle East conflict. The more than 1,700 files cover a period from 1999 to 2010. They were obtained by the TV news network Al Jazeera, which began publishing details of the documents on Sunday. Among the leaked papers, the offers relating to East Jerusalem are the most controversial. Minutes from a 2008 meeting indicate Palestinian negotiators offered to allow Israel’s annexation of all but one of the settlements built illegally in occupied East Jerusalem, without receiving any concessions in return. Al Jazeera says forthcoming documents will reveal new details about compromises the Palestinian Authority was prepared to make on refugees and the right of return, as well as on the PA’s security cooperation with Israel and its correspondence on the U.N. inquiry into the late-2008 attack on the Gaza Strip. For more, I’m joined from the Democracy Now! studios in New York by Rashid Khalidi. He is the Edward Said Professor of Arab Studies at Columbia University, the Department of History, and the author of several books, including Sowing Crisis: American Dominance and the Cold War in the Middle East and Iron Cage: The Story of the Palestinian Struggle for Statehood. RASHID KHALIDI: Well, this was the first of what is supposed to be four days of revelations of documents by Al Jazeera and by the British paper The Guardian. The concentration in the first group seems to have been on Jerusalem. And the revelations are quite striking. The most important, I think, is the degree to which not only Palestinian negotiators were forthcoming, but the degree to which the Israelis were unwilling to accept concessions. It seriously casts into doubt the idea that Israel would accept anything but complete capitulation by the Palestinians to absolutely everything they’re demanding on every front. We’ve heard about Jerusalem. There is presumably more to come. But another thing that comes out very strikingly from these documents is the degree to which the United States is twisting the arm of the Palestinians, the degree to which American diplomats, whether Hillary Rodham Clinton or Secretary of State Condoleezza Rice during the previous administration, are unsympathetic to the Palestinians and are in cahoots, in Aaron David Miller’s words, our lawyers for Israel — it’s actually worse than Miller, who was involved in the negotiations for many years, says, from these documents. AMY GOODMAN: Now, what about Saeb Erekat saying this is all “a pack of lies”? RASHID KHALIDI: Well, both Al Jazeera and The Guardian have claimed that they have very carefully investigated the provenance of these documents. I think time will tell. We have — I have no way of knowing. I think none of us have any way of knowing exactly where they come from. We are told that many of them come from the negotiation support unit. Watching Al Jazeera last night, it was clear to me that they look like they come from within the Palestinian negotiating team, in terms of letterhead and so forth. Whether there could be forgeries among them, nobody knows. But many of these things, I think, fit the outlines of what we all knew, partly because people on the Israeli side, on the Palestinian side and the American side have said a great deal about the negotiations, from 1999 certainly through 2008, and the broad lines of these major concessions made by the Palestinian Authority in Ramallah, the broad lines of the intransigence of Israel in simply refusing to accept concessions, or rather, banking concessions and then saying, “Well, now we want more. It’s not enough for you to give up every single settlement in Jerusalem except one; we want all of them. It’s not enough for you to say that you would make concessions inside the Old City of Jerusalem; we want more, as far as the Haram-al-Sharif is concerned.” The detail is what is the most striking. And I seriously doubt that, in some cases, somebody went to the trouble of forging things that showed exactly how this process took place. So, I think that we’re going to find that most of these documents probably are genuine. AMY GOODMAN: Professor Khalidi, what most struck you in these documents about the communities that the PA was willing to give up? RASHID KHALIDI: Well, in Jerusalem, there are several issues. One is that the United States, which claims to support the position which is undergirded by international law, that all settlement — across the Green Line, all settlement in occupied territories is illegal, is a violation of the Fourth Geneva Convention, is basically pushing the Palestinians to make concessions on that principle, arguing that you will not have a deal — I believe this was Secretary Rice — you will not have a deal unless you give up — I think they were talking about Ma’ale Adumim, a settlement to the east of Jerusalem, which in fact, apparently, the Palestinians accepted to give up. The point here is, this is Palestinian land, private property in many cases, across the Green Line in territory illegally occupied by Israel and into which Israel has been exporting its population, in violation, again, of the Fourth Geneva Convention. That the United States should support a position in violation of international law might not be terribly shocking, but to see it laid out in this form, I think, calls into question, at the very least, not just the good faith of the American negotiators and of the United States in this process, but the good sense of anyone who would rely on the United States as an interlocutor or an intermediary with Israel. Other things that were discussed, such as the Haram-al-Sharif, might be very shocking to people in the Arab and Muslim worlds, because it appears that the Palestinian Authority has agreed to some kind of shared sovereignty over one of the three most holy sites in Islam, a property that is a piece of territory that’s not just sacred but is also the property of the Islamic Waqf in Jerusalem, and have accepted that a committee of international actors, none of whom are particularly sympathetic to the Palestinian side — Arabia, Britain, the United States and so forth, Egypt and so forth — should somehow have control over this most holy site in all of Palestine to Muslims. This is pretty shocking. AMY GOODMAN: And the other report that we have just heard, the Israeli government being cleared in the attack on the Mavi Marmara, the Gaza aid flotilla, last May 31st, Professor Khalidi? RASHID KHALIDI: Well, I mean, this is entirely expected. An Israeli government-appointed commission, rather than an international commission, a dependent commission appointed by the government, rather than independent of the Israeli government, has come to a conclusion white-washing the government that appointed it. I don’t see why anybody should be surprised. 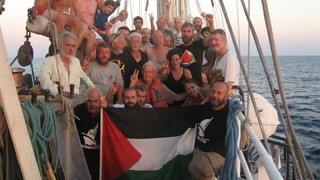 It essentially hewed to exactly the lines of the Israeli propaganda offensive that was launched the very day that this ship was attacked, which argued that the blockade of essential supplies from Gaza, which is a violation of international humanitarian law, is legal, that everything that the Israeli forces that attacked this ship did, including killing nine Turkish, including one Turkish American, citizens was legal. Essentially, this thing was written, or could have been written, insofar as what we’ve seen so far of it, by the same people who are in charge of Israeli spin management. It’s taken them a number of months to produce it, but the Israeli government spokesmen could easily have written this. Almost every key argument in this commission report was put forward by the Israeli government spokesmen at the outset of this affair. AMY GOODMAN: Professor Khalidi, I want to thank you for being with us. Professor Rashid Khalidi is the Edward Said Professor of Arab Studies at Columbia University. AMY GOODMAN: He’s written a number of books, including Sowing Crisis: American Dominance and the Cold War in the Middle East and Iron Cage: The Story of the Palestinian Struggle for Statehood.